Fleets and drivers can now see how Jaguar’s new I-Pace electric SUV would fit into their everyday journey profiles, and the potential cost savings, with the help of a new app. Free to download for iPhone devices – and launching soon for Android – the Go I-Pace app uses the device’s location services to track individual car journeys. This is then used to show how much battery would be used per trip and tell users how many charges they would need in a week if they were driving the I-Pace. This includes how many journeys would have needed an interim recharge – although the carmaker points out that as 98% of all UK trips are under 50 miles and the I-Pace has a maximum range of 298 miles (WLTP), this will not be an issue for the vast majority of the time. Once enough journeys have been logged, the app will estimate the range drivers can expect to achieve from a full charge. An interactive map allows users to search for the nearest charging points along a chosen route or within a local area. Users can also enter the real-world fuel economy of their existing vehicle to calculate the cost savings switching to the I-PACE (see road test here) would deliver. The app is expected to work alongside test drives to provide practical reasons to make the jump to driving an electric vehicle. 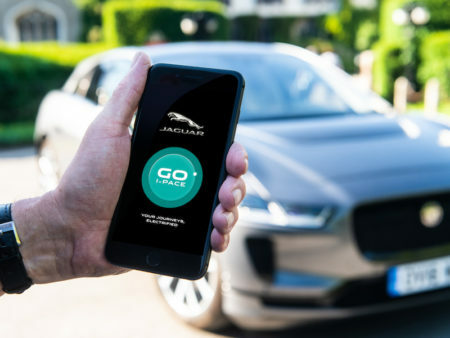 Jaguar has also teamed up with presenter and independent EV expert Robert Llewelyn to demonstrate the Go I-Pace app. To access the video, click here.